As Daval’s official supplier for this area, we are delighted to announce that we are able to offer the Yorkshire manufacturer’s 3 latest ranges, and gorgeous they are too! 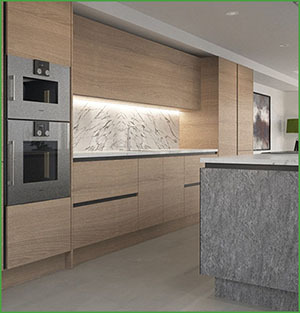 The Finsbury, Langham and Camden kitchens cover a great deal of common ground – all are very modern, handle-less kitchens and they all exploit the aesthetic beauty of texture and materials, with different takes on this theme. These are materials that have inspired the Finsbury and Langham kitchen ranges. The Finsbury range takes the metallic trend to create a streamlined, ultra-modern kitchen in a choice of Silver or Steel finishes. Here you can see it teamed with an island unit in the Mayfair range which offers contrast and interest in what is otherwise a very simple, uncluttered kitchen. The Langham kitchen is all about high drama. Using natural stone as its muse, its Slate or Basalt finishes create an exciting multi-tonal look that is shown here broken up by oversized angular handles and again, combined with a contrasting island. The Camden range takes a much softer approach than the other two but is still modern and slick. A very minimal handle-less design, each of its colour options of Cashmere, Dove Grey, Dust Grey and White evoke soft warmth with a discreet nod to Hygge! Our new kitchen gallery, including these 3 ranges and everything else that we offer, is coming to the site very soon and this will allow you to search all ranges based on a variety of keywords and design elements. Keep checking the site for that! In the meantime we can design your kitchen and show you brochures and samples during a design consultation which is absolutely free of charge so why not book one today? You have nothing to lose! Call us on 0800 321 3491 or send us a message. 1 Response to "Kitchen Trends Blog – July 2017"